In time for the WPPI 2018, Sigma has announced the debut of its new 14 – 24mm F2.8 Art Lens during the upcoming conference and expo from February 26 – 28 in Las Vegas. The wide aperture zoom lens is the latest to join the company’s robust line of Sigma Global Vision and Cine lenses. Geared towards wedding and event photographers, the 14 – 24mm DG HSM Art Lens is perfect for capturing sweeping scenes in crystal clear image quality. This wide angle offering id designed for cameras with 50-megapixel and above, and renders legendary art lens optical quality through three FLD glass elements, three SLD glass elements, and three aspherical lens elements. Sigma invites wedding and event photographers to drop by their booth during the event, not only to test drive their full line of SGV and Cine lenses, but also to interact with seasoned Sigma professionals. Aside from the new wide aperture zoom lens, attendees also get the chance to try out Sigma’s 24-70mm F2.8 DG OS HSM Art, 85mm F1.4 DG HSM Art, 135mm F1.8 DG HSM Art, and Sigma 50mm F1.4 DG HSM Art lenses. Las Vegas, NV – February 14, 2018 – Sigma Corporation of America, a leading still photo and cinema lens, camera, flash and accessory manufacturer, will showcase the latest addition to its robust line of Sigma Global Vision and Cine lenses – the 14-24mm F2.8 DG HSM Art lens – at the 2018 WPPI Expo held at the Mandalay Bay Resort and Casino in Las Vegas, NV from February 26-28. The 14-24mm DG HSM Art is the perfect lens to help wedding and event photographers capture grandiose scenes with crystal clear wide-angle shots. Not only will attendees have the opportunity to test-drive Sigma’s full line of SGV lenses at booth 810, but also interact with seasoned Sigma Pros. Furthermore, attendees can enter for a chance to win a 24-70mm F2.8 Art lens and a host of other photography accessories and special prizes! The newest arrival on the Sigma Global Vision scene, the 14-24mm F2.8 DG HSM Art lens is designed for 50-megapixel plus cameras and achieves the legendary Art lens optical quality with three FLD glass elements, three SLD glass elements, and three aspherical lens elements, including one 80mm ultra high precision molded glass aspherical element. With near zero distortion (less than 1%) and minimal transverse chromatic aberration, flare and ghosting, the new Sigma 14-24mm offers constant F2.8 brightness throughout the zoom range and delivers optimal image quality at every focal length and shooting distance. The high-speed, high-accuracy autofocus allows photographers to capture incredible, in-the-moment images. Additionally, the 14-24mm F2.8 DG HSM Art incorporates the Sports line level dust- and splash proof design, allowing for the lens to be used during varying weather conditions. Touting a brand new Optical Stabilizer (OS), Hypersonic Motor (HSM) for highly efficient and fast autofocus, as well as a dust- and splash-proof mount with rubber sealing, the revamped 24-70mm Art covers a wide array of shooting scenarios. Its DNA includes three SLD (Special Low Dispersion) glass elements and four aspherical elements to minimize coma, transverse chromatic aberration and distortion from center to edges. The 24-70mm F2.8 Art aspherical elements use Sigma’s groundbreaking thicker center glass design and highly precise polishing process, delivering stunning images and bokeh effects. The lens’ purpose-built structure boasts a new metal barrel for optimal durability with TSC composite internal moving components designed to resist thermal contraction and expansion. The Sigma 85mm Art employs a completely new high-performance optical design and premium components purpose built by Sigma R&D to produce the visually stunning bokeh effect that attracts so many photographers. The lens’ advanced architecture features two SLD (special low dispersion) glass elements and one glass element with a high rate of anomalous partial dispersion and refraction. The Sigma 135mm Art is a mid-range telephoto prime lens, touting outstanding sharpness and great IQ from edge to edge. The 1.8 F-stop delivers greater “shallow depth of field” and isolation of subjects. The outstanding compression effect makes it equally as powerful for up-close and full-length portraits. Its new large Hyper Sonic Motor (HSM) delivers ample torque to the focusing group for outstanding speed, ensuring exceptionally stable performance even at lower speeds and allowing for fast autofocus photography. The Sigma 50mm Art has been designed to set a new standard for 50mm prime performance. A Hyper Sonic Motor (HSM) ensures quiet, smooth and accurate autofocusing and paired with Special Low Dispersion (SLD) glass and Super Multi-Layer coating, the 50mm Art is a high performance lens for the high megapixel DSLR sensors. Thirteen elements in eight groups allow for unsurpassed performance even at wide apertures, and close-up photography is easily managed with a minimum focusing distance of 40cm. Back after popular demand at this year’s Imaging USA show, Sigma will host “Signature Images – A Conversation about Commercial Photography,” interactive discussion sessions featuring Sigma Pros Liam Doran and Judy Host. Together Liam and Judy will open the floor on Monday and Tuesday of the show for a dialogue with the audience on how to find success in the world of commercial photography. Attendees are encouraged to jump in on the conversation and share their insights and experiences. In addition to “Signature Images,” attendees looking to learn wedding and portraiture tips and tricks from this year’s show are invited to sit in on presentations from Sigma guest speakers, Meg Loeks (family portraiture photography), Judy Host (black & white and commercial photography) and Liam Doran (adventure and action sports photography), as well as noted wedding photographer Michael Anthony in the Sigma Theater. These professional photographers will share some of their best commercial photography shots, in addition to divulging tips and tricks on how attendees can achieve picture-perfect moments of their own. Check out our presentation schedule here! 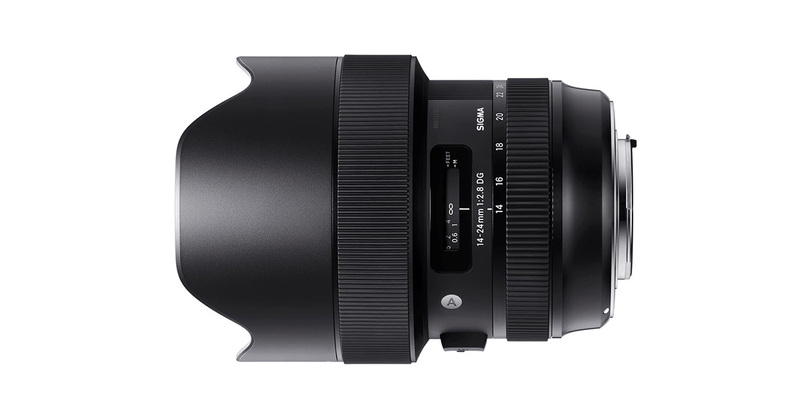 Sigma will be giving away a 24-70mm F2.8 Art lens to one lucky WPPI attendee who stops by the booth and gets their badge scanned during the course of the show. The winner will be notified to collect the prize after the show. Other attendees can try their hand at spinning the Sigma prize wheel to walk away with photo accessories. WPPI attendees will have the opportunity to try out the full line of Sigma Cine lenses on the show floor at Sigma’s shooting bay. A variety of camera systems will be available for attendees to test out all ten of Sigma’s Cine lenses.